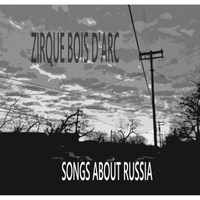 “This next song is about Russia.” A collection of songs about Russia, written by a Texas boy, and performed in three part harmony. My second solo album. Around November 2011 as I realized that the first album was gonna take some time to do, I decided to go ahead and start work on some other solo projects to make use of excess creative energy. I was drinking with Lilia and a friend of hers and this friend was talking about a metal band from Russia that she had seen that introduced every song “This next song is about Russia.” That tickled me, so…. I started asking people at bars and coffee shops and friends and folks “do you know anything about Russia?” I would take notes on those discussions, and also follow up on points they made with brief little search forays onto the internet. Also, if i was reading anything else that made mention of Russia (Murakami’s 1q84, or newspaper articles) i notated it. I then spent a year or so letting all that percolate, and then in February 2013 I wrote 12 songs and one instrumental based on some aspect of that information. I recorded these songs in March 2013 with Cisco at the helm. I played all the instruments (all acoustic) and Shelly Leuzinger and Evie Gladish sang with me. once i get a head a few ducats, we’ll get this one mixed and mastered. it sounds great so far.